DSE Tiered Storage segregates hot and cold data to designated paths on different gradations of storage media, which can facilitate cost savings for data storage. Configure the storage tier strategy and paths to each tier in dse.yaml within an Lifecycle Manager (LCM) configuration profile. 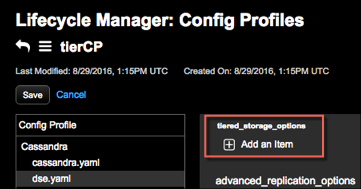 Run an install or configure job in LCM to push the configuration to all applicable nodes. 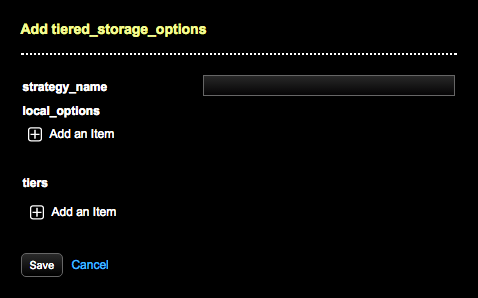 The Add tiered_storage_opions dialog displays. Optional: Under local_options, click + Add an item to add local configuration options to overwrite the tiered storage settings in the table schema. Note: The class or the tiered storage configuration name cannot be overwritten. For more details and an example, see Testing DSE Tiered Storage configurations. The Add local_options dialog displays. Enter a key and value for each local option. For example, type max_tier_ages for key and 3600 for its value. Under tiers, click + Add an item to define the paths to the storage tiers. The Add tiers dialog displays. Enter the paths to the directory for each tier in the strategy. Important: Ensure the directories referenced in the path already exist. LCM does not create the directories. If the directories do not exist when the installation or configuration job runs, DSE does not start up. Click Save to add the strategy and tiers to the configuration profile. Apply tiered storage to a table schema using CREATE or ALTER table statements, and define the maximum age of data in each tier. See Configuring DSE Tiered Storage and Testing DSE Tiered Storage configurations for complete details. Add dashboard graphs and alerts to monitor data distribution amongst storage tiers using the tiered storage metrics available in OpsCenter.